An author, a cyber-security expert, and an entrepreneur, Trishneet is surely a multitasker and an avid speaker on security solutions. It is not hard to perceive Trishneet as a regular kid going about his career, but even at a young age, he has been able to achieve a whole lot. 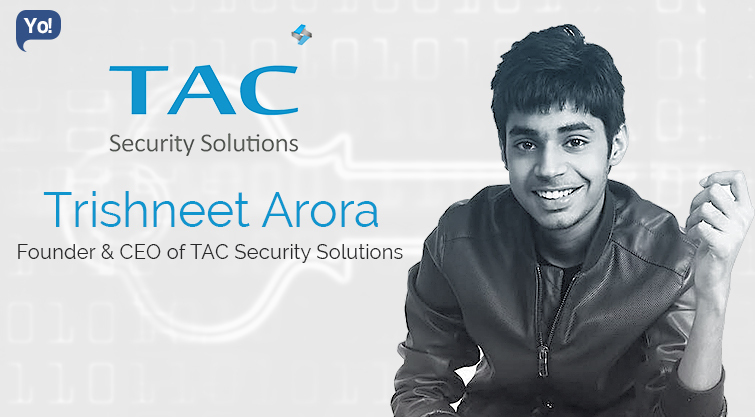 With no family background in computers, Arora, a first-generation entrepreneur, has been able to start his own company, which provides cyber security solutions to many corporates against data theft. In addition to it he has also been an IT advisor to Gujarat and Punjab police offering valuable training to senior level officers in cracking down on cyber-crime. It all started when he was 11 years old when he got his first computer. Soon he started to experiment with it and in turn learned all about computer hardware. He has also authored books like Hacking TALK with Trishneet Arora and The Hacking Era, which have given him much needed acclamation. His peers consider him a humble person with innovative skills when it comes to online security solutions. TAC focuses on providing specialized services called Vulnerability Assessment and Penetration Testing. The former helps to discover the security loopholes present in organization’s systems but does not exploit the vulnerabilities. The latter is employed to demonstrate how damaging security vulnerabilities could be in a real cyber-attack. We provide a comprehensive picture of the security deficiencies that exist within the IT infrastructure and applications, and the potential impact. . TAC informs the corporations about their glitches before any damageable cyber attack. There has been an increase in the number of hacking cases worldwide. Networks of companies are hacked and vital information is stolen creating great dangers for the company’s sustainability in today’s competitive environment. In the beginning when I told to people I am an Ethical Hacker, they often mistook me as a criminal. Now I am changing their thoughts hacking can be ethical. Think new ideas and work hard to implement them, but don’t accept results instantly. Handling a woman. Just joking. But, truth is; I am still waiting for the most challenging part. My company’s credibility is shown its clients. we include big names in our client list like Reliance Industries, Amul, Central Bureau of Investigation, Punjab Police (India) and Gujarat Police. I can never brain drain because of work. I love my work. I used to give my trust off too easily, even on people i had just met. It backfired me hard . I believe on showing my plans in reality rather than speaking about them. This is a good question. I would like to start as a politician. Because, being a youngster I know what young India wants, I will support our youth and create laws accordingly. Those places are my dream places which I can’t visit. “Don’t do the work that will make you proud, do the work that will make your parents proud”.